I pulled the boat out of the water in April just after Colin was born. It was a good time to tackle this project since Millie's parents were staying with us at the time to help. A typical haulout entails sanding and repainting the bottom, waxing the topsides, servicing the prop, and lubricating the thru-hulls. I hadn't hauled the boat in the 6 years I've owned it so I wasn't exactly sure what I'd find and how much work was needed, but I gave myself a week to do the work and get the boat back in the water. I thought this would be enough time if I worked all day. And, the fact that the yard rates doubled after 10 days provided the motivation to get it done quickly. The hull looked pretty good at first look. The old bottom paint held up well. It seemed my routine dives to clean the hull kept most of the large growth away. I was thinking I'd need a couple days to sand off what was left of the old paint and then start rolling on the new paint -- no problem. But after a day on the sander the job suddenly became much more bleak. There must have been six coats of old paint on the hull which should have been removed before recoating at some point in the past. Unfortunately, the layers just kept accumulating; and the perfectionist in me just couldn't leave it all there to be painted over again. 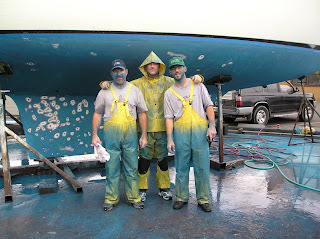 So, with some much needed assistance from my brothers we geared up and attacked the old paint with air-powered sanders and garden hoses, leaving a sea of blue in our wake. In the process of removing the paint we uncovered a number of gelcoat blisters. These appear when water works it's way into small voids in the fiberglass. I expected to see a few of them and was prepared to grind them out and fill them wtih epoxy as needed. So, each time we came across a blister we'd turn the sander on it to open it up and dry it out. More and more blisters appeared from under those layers of paint until the hull looked like someone tossed a grenade at it. It was about this time that I also uncovered a large gash in the bottom of the keel hiding beneath old paint and boat caulk. It looked like a bad repair gone horribly wrong. This was going to take some time to fix. So, my week of routine maintenance turned into two weeks of back-breaking labor. I guess that's to be expected with any estimate for a boat project. I was very thankful to get help from Ron and Ricky for a weekend and then spent the next week filling, sanding, and painting all the holes we put in the hull. I hired the yard to fix the botched keel repair which bought me some time on the yard rate increase, and got busy waxing. In the end I was able to get all the work done, and exactly two weeks after she came out Jean Marie went back in the water. There isn't anything that time and money can't fix. That seems to be my mantra now when it comes to boat work.